uses these communication pathways to direct available resources to restore balance. Your body is so effective that in most instances you won’t even know there was a challenge. When your body encounters a bigger health challenge, you may begin to show symptoms. Symptoms are the outward expression of your body’s best efforts to deal with these bigger challenges. Common symptoms may include elevated body temperature, swelling, pain, tiredness, or a cough. Once you recognize a symptom you can begin to assist the healing process. Things like getting more sleep, drinking more water, taking nutritional supplements, or medication can help your body deal with these challenges. Too often we ignore our health until we get so sick that symptoms appear. Wouldn’t you rather support your body’s day-to-day efforts to deal with the little challenges? But how can you learn what your body needs? Whether your challenges are great or small wouldn’t it be nice if you could just ask your body? 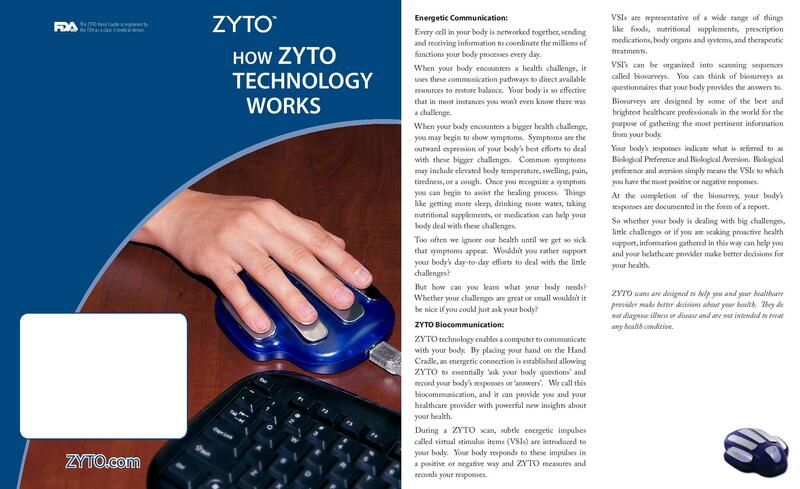 ZYTO technology enables a computer to communicate with your body. By placing your hand on the Hand Cradle, an energetic connection is established allowing ZYTO to essentially ‘ask your body questions’ and record your body’s responses or ‘answers’. We call this biocommunication, and it can provide you and your healthcare provider with powerful new insights about your health.During a ZYTO scan, subtle energetic impulses called virtual stimulus items (VSIs) are introduced to your body. Your body responds to these impulses in a positive or negative way and ZYTO measures and records your responses. VSIs are representative of a wide range of things like foods, nutritional supplements, prescription medications, body organs and systems, and therapeutic treatments. VSI’s can be organized into scanning sequences called biosurveys. You can think of biosurveys as questionnaires that your body provides the answers to. Biosurveys are designed by some of the best and brightest healthcare professionals in the world for the purpose of gathering the most pertinent information from your body. Your body’s responses indicate what is referred to as Biological Preference and Biological Aversion. Biological preference and aversion simply means the VSIs to which you have the most positive or negative responses.At the completion of the biosurvey, your body’s responses are documented in the form of a report. So whether your body is dealing with big challenges, little challenges or if you are seeking proactive health support, information gathered in this way can help you and your helathcare provider make better decisions for your health. sent to the body. These VSIs elicit physiological responses from the body, one of which is a change in the conductivity of the skin (GSR). These fluctuations in skin conductivity are measured and sent back to the computer for analysis and interpretation. that create greater coherence than the baseline are given a positive score and signatures creating less coherence than the baseline are given a negative score. The data received from the hand cradle is plotted and analyzed for coherence. Each response is given a positive or negative score called a Deviation Ratio (dR). Positive dRs are referred to as biological preference, negative dRs are referred to as biological aversion. After analyzing the data from the hand cradle, the computer displays the data in an easy-to-read graphical interface. The data shows the body's responses ranked in order of priority. Results are optimized and time is used more efficiently by focusing on the body's priorities.